Long ago, in what feels like more than a decade ago, most of the world’s home security systems used either our home phone lines or hard lines in order to monitor our system. And even though security systems these days are largely connected via Wi-Fi, many often wonder if it is necessary to have that to have the internet to keep us safe and secure. Well, wireless monitoring makes it possible to keep your house secure without the aid of the internet or Wifi. Home, business or property security without Internet: it really is possible. Keep on reading for all the details! We’ll help you choose the best option for your budget and needs. What is a Wireless Monitoring System? A wireless monitoring system is one in which there is a control panel and several sensors. The control panel can be placed in a fixed position, which is usually the front door. Wireless monitoring consists of of the following devices. Keep on reading for more ideas about how to protect your property without Internet. 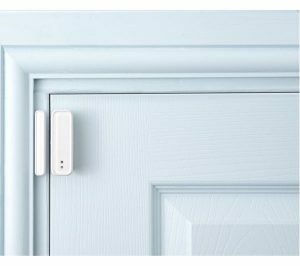 The first low tech home security system we’ll talk about are window and door sensors. Basically, they’ll let you know when any of these things are activated. For this, you don’t need Internet. Door and window sensors have two distinct parts; one is a transmitter or sensor and the other is a magnet. If the devices are separated by more than two inches, the sensors will be activated. Upon opening any door, your device will let you know that the has been opened. There are even some security systems out there that let you know which door or window has been opened. When you’re going to install the sensors, place magnet on the door and the transmitter on the frame. Be sure that both of them are aligned so that the system knows when the sensor has been triggered. Which Window/Door Sensor to Buy? Motion sensors are very crucial at detecting potential thieves in order to protect you and your family. As the name suggests, these sensors activate upon detecting any kind of movement. You’ll need to place the sensors in a place where they can cover a wide range of space. The most ideal areas to place them are either the left or right corners of the ceiling where there is nothing blocking its field of vision, such as a large flat screen TV or cabinet. They’re usually powered with batteries, so be sure to check them periodically to make sure you’re still safe and sound. Never place motion sensors on the window or near a bedroom door. This is because constant movement from window blinds as well as closing and opening of doors can disrupt the sensor’s operations. Instead of that, you should put it outside of your hallway, especially in an open area. If your house has a second or third level, then place the sensor in the halls of those levels near the staircase. Crime Prevention Security Systems says that outdoor tables as well as tall trees provide easy access to your house’s second story and room. 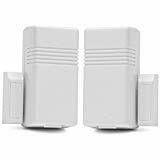 You can learn more about this cheap home security without Internet device: Motion Sensor Alarms for any Budget. Even if you have a home security system that requires the internet, the sensors will continue to function and let you know if any of the doors or windows are opened and if there is any movement inside your house. During such times, it could be possible that there may be a disconnect between your system and the company that runs it. You can opt for a security company that specializes on cellular monitoring, which is on a different frequency than wireless monitoring and is more reliable. While there are many security cameras available on the market, many of them have Wifi connectivity. So what happens when a homeowner doesn’t find such a camera? Do they have other options? The answer is YES. There are other types of security cameras that can be hardwired into one’s house. And, a hardwired camera provides the same kind of protection as that of one with online connectivity. 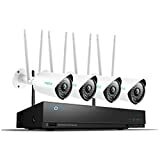 You might also consider wirelessly connecting a camera to something like a nearby TV for live streaming and recording. But please note: this option does require you to have a power source, even though you may not have Wi-Fi. Although the options for accessing security cameras are different for hardwired cameras, and they may not use a smartphone app, that does not mean that we can’t access them at all. You can hook up the NVR to a HD TV or monitor and see what’s going on, just not remotely. You can also go back through the footage to find what you’re looking for. Hardwired cameras can still work to deter crimes, make homes safer and help homeowners get what they want from both the cameras and the security system in general. Some of the negatives are that cloud storage won’t be an option, but most people get around this by using a hard drive. In addition, you won’t be able to communicate remotely using these devices. Although wifi-controlled cameras are more convenient, there are times when people have alternative choices. In fact, there are wifi cameras that generate their own signal, so there’s no need for extra online capability. They should pair up easily with the NVR, even without a WiFi connection. Accessing footage for later is fine, but one of the downsides to security cameras that lack online connectivity is that we can’t see what is happening back at our homes while we’re out like we can through a smartphone app. Not knowing what is happening at every crucial minute could make one paranoid and worried. That’s why any homeowner who wishes to monitor their house in real-time might as well be better off getting a Wifi-connected home security camera. As we mentioned earlier, there are other security cameras that operate without the internet and it all depends on asking the right company for it. There are also choices available for homeowners who create their own security systems instead of having to rely on a professional security company to install and monitor the systems. While it might not be the right choice, some homeowners believe getting a Wifi-lacking HD security camera is an excellent choice as well as a system they can monitor. If it is what a homeowner is looking for, then it can really add to their peace of mind. Their standard wireless cameras that connect to a hard drive don’t require Internet access in order to function. 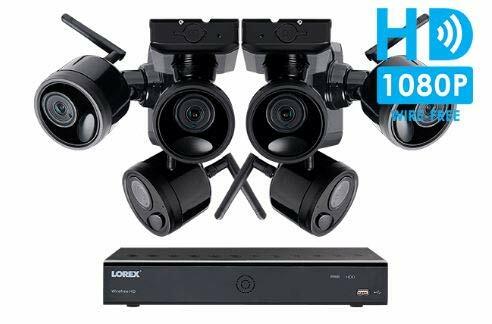 You can learn more about Lorex here: Lorex Home Security Systems Review. Okay, so you’re at your grandma’s house, on a farm or warehouse and you don’t have access to WiFi for whatever reason. 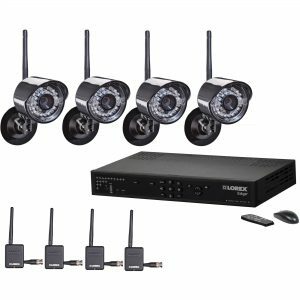 Is it still possible to set up a security camera system without Internet? Let’s find out. With this setup, you can simply monitor your home or office around the clock, and record the footage on your hard drive. The NVR and cameras should automatically connect to each other with most systems, even when you don’t have Internet access. Then, you can connect your NVR to a HD TV or other kind of monitor and see what’s going on! The surveillance cameras captures the footage while the NVR is recording the video footage. You can view it only at the location of the NVR and monitor though. Normally, you’d hook up your DVR, NVR (or computer) to the LAN (local area network) slot on your modem. However, in this case, you’ll pair your cameras directly to the NVR. However, you will be unable to access remote viewing and motion alerts without WiFi. You’ll have to connect your system to a router and WiFi if you want this capability. 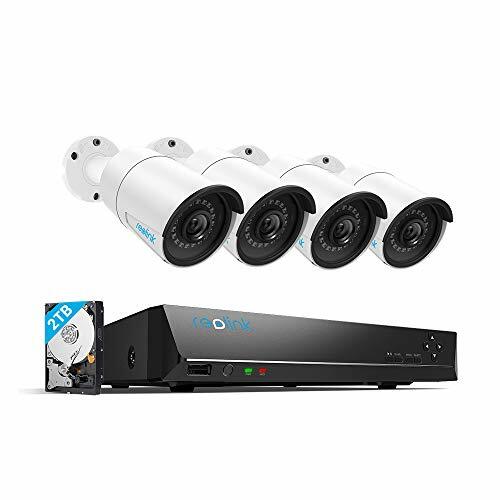 Here’s one of our top picks for wireless cameras and NVR that you can use without Internet: Reolink 1080p 4 Channel Home Security System. Another option for home security without Internet are wired cameras. The major difference from the above example is how the data is transmitted. In this case, it happens via cable from the camera to the NVR, instead of via a wireless IP connection. This can be a very secure way to protect your home, as long as you hide the cables well! Nobody can gain access to your security system and you alone can view the video footage. It’s a smart choice if you are filming some sensitive things. 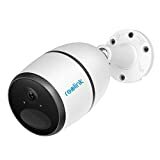 Here’s one of our top picks for wired security cameras that don’t require wifi: Reolink 4 Camera (wired). 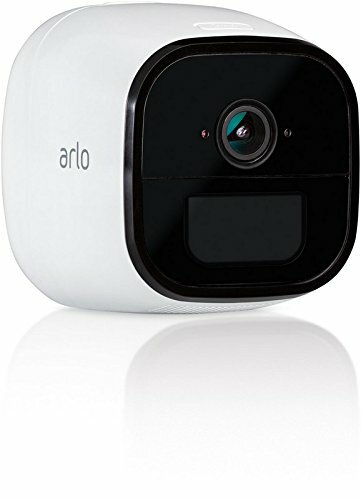 If you’re looking for a top-quality wireless camera that doesn’t require Internet, then you’ll want to consider the Reolink Argus 2. There are a number of feature you’ll love about it. If you do connect this security camera via the Internet, you can access the footage 24/7 via Reolink phone app. Option #4: What about Remote Access with No Internet Connection? Okay, so you still don’t have Internet or a wireless router, but want to have remote access to your security footage. After all, what’s the point if you can’t keep an eye on things when you’re not there? There are many kinds of cellular networks, depending on where you live (2.4 Ghz, 5G, 4G-LTE, etc.). Are there any Negatives to Security Systems that use Cellular Networks? There are a few things to be aware of before dropping your money on one of these instead of a traditional security system. You may experience zones of no coverage, depending on what network you choose which can be extremely frustrating when you’re trying to set it up. It can be quite expensive, particularly if you place it in a location that may trigger the motion detector frequently. It requires a monthly fee. 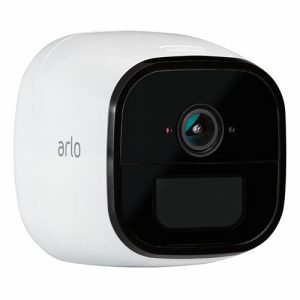 Just about the only negative is that it does require you to purchase the Arlo mobile service plan. 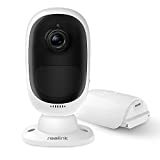 However, if you want an easy to set up security camera that doesn’t require Internet, this may be one of the best options for you. What Do People Think About the Reolink Go? A good security company can hook you up with a suitable security system and provide you with numerous choices. This means that they can find the right kind of security system and camera, especially those that come with a high protection level as well as peace of mind. Thankfully, there are many security companies out there, but it all depends on the homeowner on whether they want to ask a company for help or whether they want to do it all on their own. One thing is for sure however, and that is that home security and automation have come a long way and have a lot more to offer today than they did decades ago. You can learn more here: Review of SimpliSafe Home Security System. Home Security Without Internet: Have your Say! What are your home security without Internet tips and tricks? Do you have any questions for us about security cameras without wifi and how to set them up? Leave a comment below and let us know.